The Flanders band Theudho has been ravaging the shores and land with their pagan black metal for a good 15 years. Having left behind their original Scandinavian signs, the band is now using the proto-Germanic word for ‘people’ or ‘nation’ as a name. Maybe ‘folk’ captures it better. The band has actually been very prolific and part of a number of tribute compilations throughout the years. In 2016, Theudho returned to being a one-man outfit under the creative guidance of Jurgen S., who also played in a number of different projects, amongst his recently established Slithering Decay. ‘De Roep van het Woud’ is a record in the best pagan metal tradition, embracing the natural realm as inspiration and topic. Inspiration is also derived from Scandinavian stories, which is always a good thing. 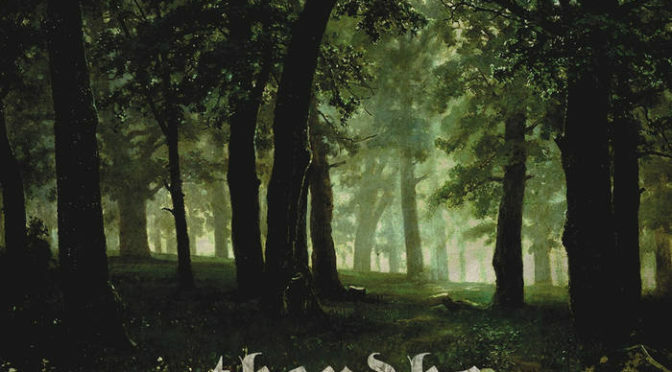 Brisk black metal finds itself interchanging with soothing passages through the woods. At those moments, the vocals also turn to a speaking form, proclaiming the will of the woods. Some unexpected breaks hit the listener during ‘Waar Kraaien de Ondergang Bezingen’. The lyrics are sung in Belgian with an unearthly voice. Belgian, for those that are confused, here means the Flemish Dutch. The sound of Theudho is strong, firm and very well crafted. The repetitive nature harks back to the originators, such as Bathory and perhaps a harkening to the likes of current-day Darkthrone with that raw, direct sound. Nowhere this sound comes out as clearly as on ‘De Boom van Hakiloheim’, with jagged, violent riffing and vocals barked in harmony with their onslaught. It’s a similar vibe that you get a little later on ‘Slangentongen’ and the vitalist ‘Saksenslacht’. Songs with a cold fury, impersonal but burning with force. Synths add the needed atmosphere here and there, enhancing the black metal that clasps on to you like the resin from the endless trees of the primordial forests that are sung about by Theudho. We leave the realm of Theudho with the atmospheric outro track ‘Het gedrocht in de diepte’, which leaves you with the sense of foreboding doom and ever-present evil. It’s a great way to end on a high note I suppose.